"This is a quick and easy breakfast that even kids will love. With Greek yogurt, it's got a decent amount of protein to keep you full until lunch. Most blenders work best with solid ingredients closest to the blade and liquids added last." 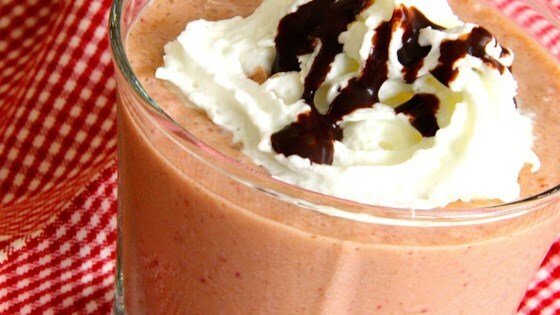 Blend milk, yogurt, banana, strawberries, and chocolate-hazelnut spread together in a blender until smooth. So I put some blueberries in mine and I didn't put Greek yogurt but it still tasted good .Nice recipe I loved it ! 5 stars from the kidlets. 4 stars for me since it was so sweet. I used French Vanilla frozen yogurt instead of Greek yogurt, but I will use that next time. GREAT tasting!!! Loved it! I will have this one again. Little bit heavy on the yogurt, but very good nonetheless!